Author Q&A: Playwright Arthur M. Jolly, "Childish Things"
Arthur M. Jolly is an award-winning playwright and screenwriter who has penned over 50 plays that have been produced across North America, Europe, Asia, Africa, and South America. His play Childish Things was recently published in the Applause Books series The Best American Short Plays 2015-2016. He adapted a feature film version of his award-winning stage play A Gulag Mouse, which is currently in post-production. Read my first interview with Arthur Jolly, back in 2009. Arthur M. Jolly talks about his inspiration and the process of writing Childish Things, plus some of the greatest mistakes playwrights make (and strategies to avoid them!) in this Author Q&A. What inspired you to write Childish Things? The play deals with an older guy who tries to explain to his estranged adult daughter that he has a terminal disease using a pair of stuffed toys he used as puppets when she was a child. It was written when my son, who is six, decided he was too old for Teddy and Floppy Bunny anymore. Those two animals were packed in every suitcase for every trip we took, they were constant companions for years, and yes, I would make them have conversations with each other before his bedtime almost every night. Sometimes they would just be silly or tell stories, but they would also get him to talk about issues that were troubling him. Sometimes you can explain to Teddy the things you can’t tell your parents, and sometimes Teddy and Silly Bunny can hash out something–like why some kid at school was mean that day–in conversations with each other. Eventually, he outgrew them (on all but very rare occasions), and I was feeling a real sense of loss that it was, to use the biblical phrase, time for him to “put away childish things.” I was away on a business trip, missing him like crazy, and I wrote the play because I couldn’t sleep. Typically, I will go through numerous drafts; this one received some minor line tweaks, but never substantially changed. I was fortunate enough to hear the monologue that the daughter, Rachel, has before she leaves performed at the Last Frontier Theatre Conference, and adjusted her big moment a little from that. But honestly, this one came out much in the final form. I submitted it to a handful of ten-minute play festivals, which is my typical response whenever I write a new piece, and it was soon produced–initially at a Community College in Oregon, but later in Houston at Mildred’s Umbrella and Los Angeles at the Stella Adler/Hollywood Short+Sweet Festival. It also opened in Chicago in April, courtesy of the Midnight Summit Ensemble. How was “Childish Things” chosen for The Best American Short Plays 2015-2016? And how exciting! When I first started writing plays, I would go to my local library and read this play series. It’s been going strong for 70 years, and all the greats have been published in it along the way. This was my education in playwriting, and to be included in the latest volume is absolutely thrilling. They had an open submission process for plays that had been produced in the previous year, and I just sent mine in and crossed my fingers! What is your favorite part of writing plays? The greatest challenge? My favorite part is when it’s easy. For me, those times are few and far between, but when they happen, I find the characters clamoring to be heard, talking over each other so fast I cannot keep up with my typing. I know where the scene is going, I know what needs to happen, and it races along. Those moments are golden and, once in an incredibly rare while, one of them will do or say something that is so unexpected that I stop in my tracks, amazed that they thought of that without me. I love those times. The greatest challenge is that those are the exception. The vast majority of the time, it is a daily slog to try and get a play to progress, inch by bloody inch. It’s like skiing in some remote mountain range without a chairlift in sight: weeks, months of uphill struggle, followed by an exhilarating burst of speed and excitement. What are some of the greatest mistakes new playwrights make? And how can they avoid them? I think there are as many mistakes as there are playwrights! For some, they spend so much time going over and over the same piece of work without ever really progressing. I’d suggest a strong writer’s group, outside feedback, and mixing with other playwrights going through the same process. For some, it’s talking ideas to death instead of sitting down and putting them down in some form–even in a badly-written form. You can make it better later, but you have to get it down first. For those writers, I’d suggest spending less time socializing with your writer’s group and less time reading and researching and wasting time with others going through the same process. Just sit and write. So, conflicting advice. It might be that you have to do both, and when you alternate in rhythm with your writing, you surf on a wave of creativity. But when you’re out of sync, you just paddle back and forth and occasionally get smashed onto a reef. Read plays. See theatre. If it’s great, it inspires you to be your best; if it’s bad, it inspires you to do better. What is the status of the movie version of Gulag Mouse? The movie is in the editing process now. I have seen a rough cut of the trailer and it looks amazing. There’s also a lot of discussion about the title. The producers are reaching out to focus groups on finding something that works; apparently, not enough people know what a gulag is. So much fun! I started out in the film industry, but I hadn’t been on set for many years. I was there for the entire shoot and loved every minute of it. What do you know now that you wish you knew the last time I interviewed you? I think I know a little less than I did eight years ago. I re-read that interview, and it seems that that writer was totally convinced about his writing and how it was all “meant” to work. I want to take him aside and say, “Yes–sometimes. But only sometimes.” Now, I’m discovering new things as I go. 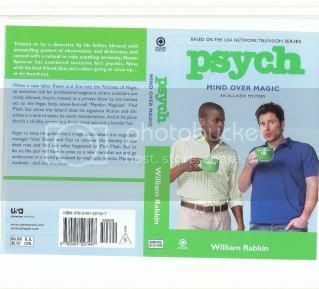 Author Q&A: William Rabkin, "Psych: Mind Over Magic"